Yesterday, I let Colin talk of his experiences with bad customer service and if you haven't read his blog yet, you can do so here (Lack of) Customer Service. So I thought today I would chat about good customer service. Which is something I am very passionate about. Before I start, I just want to say that I agree with everything he is saying in his blog about how large companies often forget the very basics. It is no secret that I work for a large multi national company with the biggest DIY market share in the UK and much of Europe. Now people will argue that we have forgot the little guy and customer service is not important. 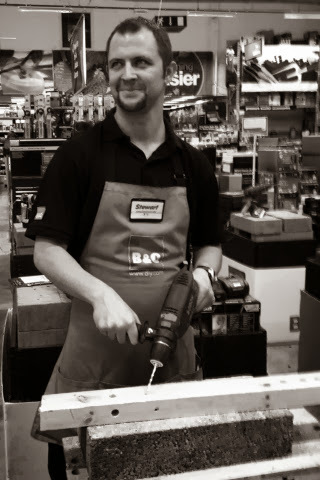 In fact a quick look at the B&Q twitter feed will tell you that all we seem to do is dealing with problems or giving bad service across our stores. As consumers, we expect good service all of the time and rightly so. But I often feel that we don't shout enough about good service as individuals enough. If somebody is really nice to us in a shop or a store, we might tell one or 2 of our friends but rarely write a letter or take to twitter to tell the company. I have recently started on the showrooms department in my store and this is an area that as a customer you would expect the best kind of service, especially if you are spending 5 or 6 thousand pound on a kitchen. I don't work in a massive store so naturally we don't have all the stock of everything we sell and a lot of items have to come from our suppliers or from our large fulfilment centre. So my job often involves negotiating earlier delivery times for bits of customers kitchens. Naturally at this time of year they want it before Christmas, but with a few things we haven't had enough stock etc. In one case, my colleague drove around the whole of the region picking up bits of stock for various customers so we could get it to them in time because the supplier or fulfilment centre had not got them to our store on time for delivery. There is another colleague who works tirelessly in her office all day often correcting everyone elses mistakes so nothing does go wrong with a customer's order then she will coach that person on what to do right next time. Her job role tells her to escalate it to a manager, but then it wouldn't get done in time anyway and there would be far more issues. Me, well it has just gone 6 o'clock and I "finished" work an hour ago after not even getting chance to have a lunch break properly because I was that busy. Also, I have just got off my mobile phone to a customer and a colleague in store so they could arrange another delivery for the customers order. I think what frustrates me personally is that from the outside it seems very easy to criticise big companies but from the other side I know there are individuals like myself and many other of my colleagues who do their utmost every single day to give the best customer service every day. I am not saying there are not people who could not care a less because there are people like that in every organisation unfortunately. Or even that we don't get things wrong because we are only human at the end of the day. But to me and many people in similar roles such as mine the little guy is still important because that little guy is me, its you, its our brothers, sisters, mothers, fathers. it is all of us.